If my six different inboxes are any indication, retailers and businesses of any type don’t use Halloween as the awesome opportunity it is. I received all of two Halloween inspired emails, which is rather pathetic. 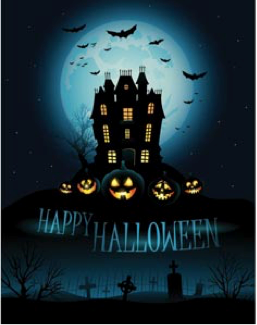 It’s a playful, fun, and joyously spooky time of year – why would retailers shy away from such a great opportunity? Are they worried they’ll offend? Seriously? It’s called testing people, simple A/B testing…. Use it or doom your email program to meager, average standards and allow your brand to be forgettable. Just thinking about all the missed opportunities over the past several weeks saddens my Vampire heart and lacks stimulation for my Zombie brain. Considering that their website already has snow in their banner with Holiday messaging, their eyes are clearly on the Christmas prize. I also checked my backlog of ThinkGeek emails for the two weeks prior to Halloween and saw nothing with even an inspired use of Jack-O-Lanterns. Tears of blood are staining my Doctor Who t-shirt with sadness. Granted, this email was sent via their Credit Card company, but it leaves zero excuses for a brand that is notorious for protecting their image. With the moolah Walmart possesses, they could do so much better. At the very least, it is definitely Halloweenie. But, what I’d like to know is where were the ghost GIF’s and the eye-popping zombie live-content pieces? Not a single ghoul jumped from the shadows to torment me into purchasing anything at all – what type of email world have we come to? Sure, I’m happy to see that more and more retailers are understanding that the Christmas holiday season is underway – on November 1st, that’s cool. However, it really shouldn’t start too soon or you risk losing people to Holiday Over-Kill and their enchantment with your brand could wane. Use Halloween as the spooktastic holiday that it is – a Pre-Christmas Festival of Horrors that can lead a memorable path to the Christmas Holiday. Using seasonal holidays keeps your email program fresh and shows you’re on top of things, creative, and makes you memorable. Consumers are getting smart to all our marketing tricks, so give ‘em a creative treat and show them your brand is more than a bag of marketing tricks. Samantha Iodice is an Email Marketing Expert experienced with multiple industries such as Financial, Retail, Travel + Tourism, Automotive, CPG, B2B, Insurance, Service and Non-Profit. She also provides training and writes branded content. Connect with Samantha at www.TheEmailMaven.com. Wednesday, 05 November 2014 Stop Freaking Out and See the Opportunity!